Go all out! vs. Focus on healing was a Splatfest event in Splatoon. It was held for Japan only. It was announced on 4 March 2016. The results were given on 13 March 2016. 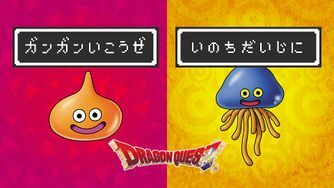 The event was held in cooperation with Dragon Quest. The three stages selected for this Splatfest were Blackbelly Skatepark, Moray Towers, and Mahi-Mahi Resort.